Debbie Gravitte has had a varied career that has taken her from Broadway to Symphony Hall stages and all points in between. She won a Tony Award for Best Featured Actress in a Musical for Jerome Robbin’s Broadway, along with a Drama Desk Award Nomination and New York Showstopper Award for the same role. 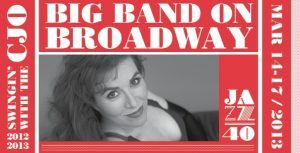 After making her Broadway debut in the original cast of They’re Playing Our Song, she went on to appear in Perfectly Frank (Drama Desk Award Nomination), Blues in the Night, Ain’t Broadway Grand, Zorba, Chicago, and Les Miserables. Debbie has appeared in the Encore’s series productions of The Boys from Syracuse, Tenderloin, and Carnival at New York’s City Center. Debbie has performed her nightclub act worldwide, from New York City’s Rainbow and Stars to London’s Pizza on the Park, and back home again to Atlantic City, where she had the honor to perform with notable talents such as Jay Leno, Harry Anderson, and the legendary George Burns. Debbie has sung with numerous orchestras including the National Symphony Orchestra with Marvin Hamlish, Boston Pops, Cleveland Orchestra, and others. Overseas, she has sung with the London Symphony Orchestra, Stockholm and Munich philharmonic orchestras, Royal Scottish National Orchestra, and others. Audience members can also join Byron Stripling for a casual and engaging conversation with Debbie Gravitte (Sat. March 16, 2:00 p.m.) and the wonderful guest artists of the Columbus Jazz Orchestra in a new workshop series at the Jazz Academy. “Offstage at the Jazz Academy” provides participants a behind-the-scenes glimpse from the artist perspective on performing with the CJO – adding new perspective to being an audience member. In addition to the opportunity to learn something new, each guest artist will be asked to share what they are currently listening to on their iPods or CD players, introducing audiences to new and exciting music and artists. “Offstage at the Jazz Academy” is free to CJO subscribers and $10 for general registrants. Pre-registration is requested and available by clicking here. Previous post: Ken Messer & the Phoenix Project CD Release Party for "Tsunami"